In recent years, The Conjuring series has become immensely successful both critically and commercially. In the wasteland of cheaply made and by-the-numbers horror flicks, The Conjuring and The Conjuring 2 are undoubtedly one of the few exceptions of how to successfully execute the horror movie formula with a studio budget. 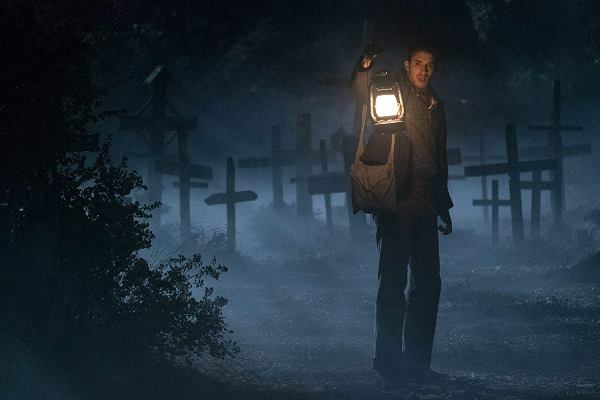 However, this success has unfortunately led studio executives to milk the Conjuring cow for all it is worth, which has meant low-budget spin-offs that cash on their minute connections to the Conjuring movies but aren’t nearly as good as them. 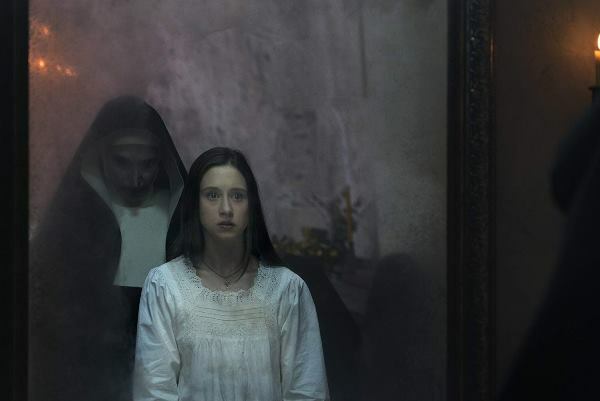 The Nun is the latest film to join the Conjuring universe. 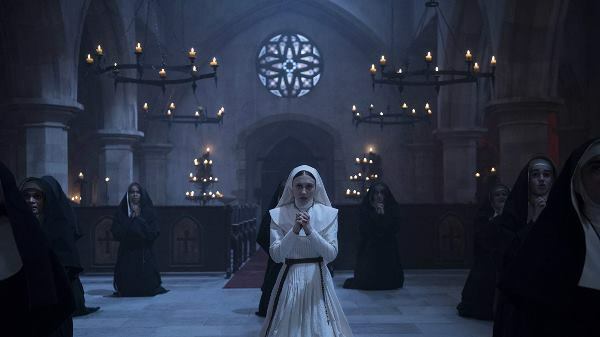 Unlike Annabelle and Annabelle: Creation, its connection to the series is through The Conjuring 2 rather than the first film and this film acts as a prequel, focusing on the story of Valak, the demon that would take the form of a sinister nun in The Conjuring 2. 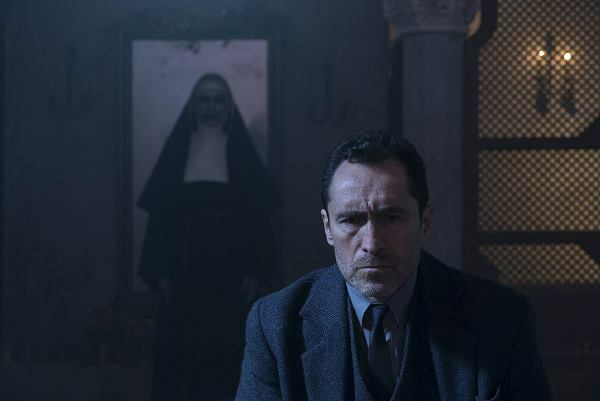 After a young convent nun takes her life following an encounter with the forces of darkness in 50s Romania, The Vatican sends a Catholic priest with a background in exorcisms, Father Anthony Burke (Demian Bichir), to investigate exactly what is going on. He enlists the help of a nun-in-training, Sister Irene (Taissa Farmiga), and a local named Frenchie (Jonas Bloquet). However, once they begin investigating, they learn that the force they are up against is far more malevolent than they could have initially fathomed. A prevalent problem with prequels, particularly horror movie prequels, that studios don’t seem to realise is that more backstory almost never translates to more scares. 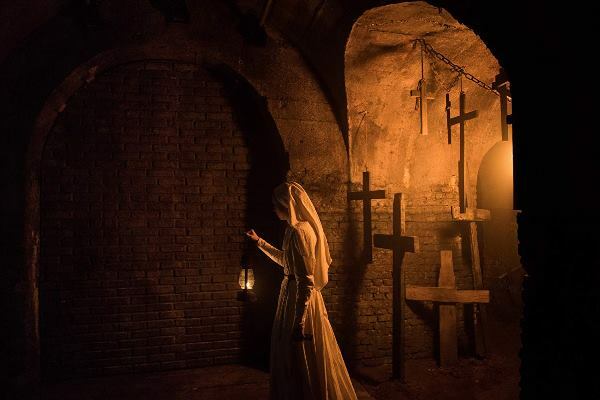 The idea that exploring the origins of a mysterious character by taking the story into an older time (50s, 60s) and a secluded setting (farmhouse, castle) will somehow translate into more or any scares is inherently flawed because it’s actually the mysteriousness and lack of backstory that makes characters like the Nun scary at all. 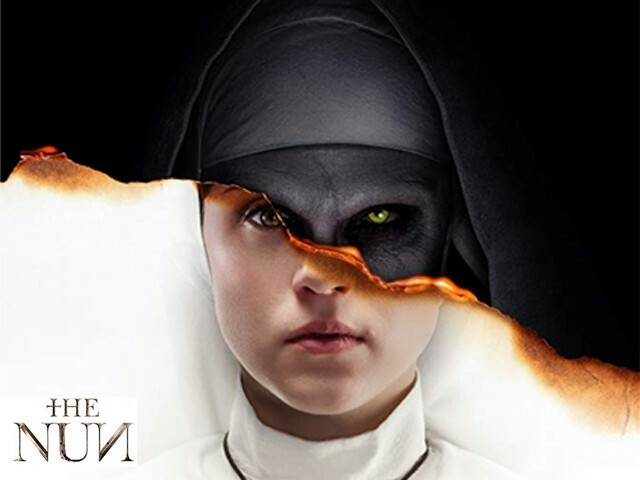 And this is one of the major problems with The Nun. There is simply too much unnecessary backstory and exposition. 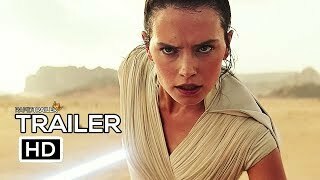 On one hand, the movie desperately wants us to believe that the characters are facing a force of pure evil that cannot be avoided easily, and on the other, it insists on letting words speak louder than actions. Unfortunately, when it comes to the actual scares, the movie stumbles there as well. The reason being that Director Corin Hardy throws everything but the kitchen sink at the screen. 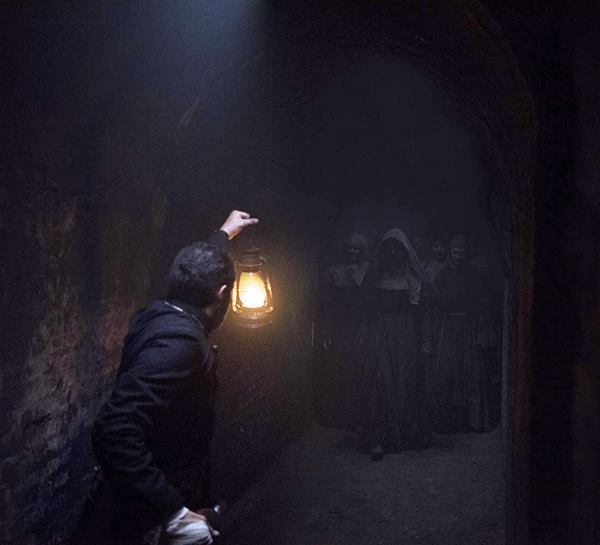 The movie moves at a brisk pace once the story is established but the barrage of jump-scares are poorly telegraphed and can be seen from a mile away, while the violence, which is particularly graphic for a Conjuring film, fails to register on a visceral level. That’s not to say that there aren’t a few creative sequences that actually are scary, but the film largely fails to utilise its spooky castle setting that is full of creepy, dimly-lit hallways and invoke a genuine sense of foreboding. All these shortcomings ultimately stem from the script penned by It and Annabelle writer, Gary Dauberman, which is painfully predictable and devoid of any consequential arcs for its characters. Dauberman uses the ‘haunted house template’ of throwing these various characters into a scary setting (in this case the castle) and remains content at letting the banal exposition and boring dialogue tell the story. It just doesn’t work! The performances fail to impress, although the actors are hardly to blame given the bare-bones script they are provided to work with. Bichir lacks the charisma to make Father Burke an interesting character but Farmiga and Bloquet do make their presence felt. Bloquet often serves as the comic-relief of the film in small doses, while Farmiga gives a serviceable performance playing the role of the girl in peril, something she did far better in American Horror Story. All this is not to suggest that The Nun is a complete failure. There are some redeeming aspects in the performances and the brooding cinematography certainly stands out. But ultimately, the film adds little to the Conjuring universe nor is there anything that sets it apart from the countless run-of-the-mill horror movies we are so used to seeing. 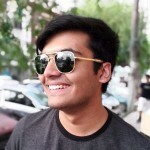 I think the writer of the blog did not completely understand the storyline. The story was very well crafted and explained the origins of the demonic forces prevalent in the church (in the form of a Nun). Also the ending of the film was very well linked with The Conjuring (part 1) session when Ed Warren was explaining the failed exorcism. The story writer has also left one aspect to unfold, which was the relevance and linkage of Sister Irene with Loraine (in reality there is a linkage, both screen actresses are real sisters to each other), however the director has to unfold the enigma of linkage of both the characters. 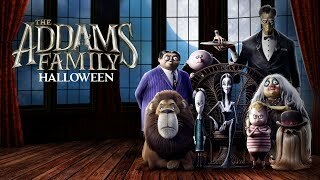 Overall the film is a good watch, though I agree with Khalid that it has lesser scary sequences as compared to the earlier installments of the Conjuring Universe. 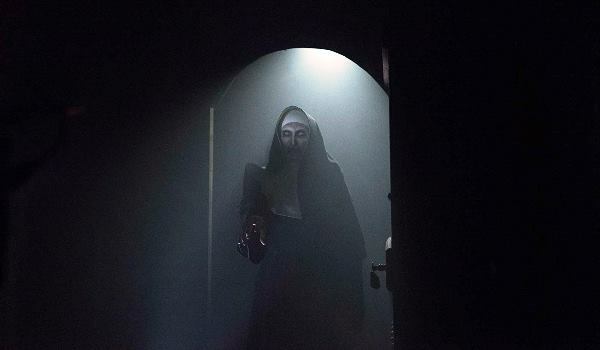 However, surprisingly Nun is biggest commercial hit among all the earlier franchise installments, even it has grossed higher than The Conjuring.